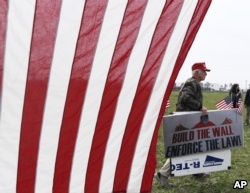 Trump said he noticed the repaired holes in some parts of the existing fence at the border. 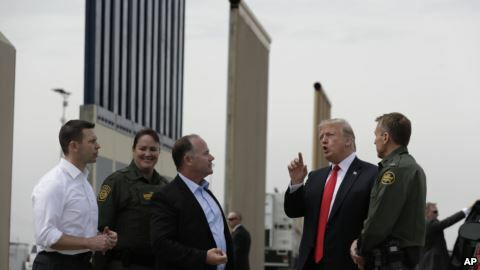 He described the existing wall as “lousy” but noted it stopped as much as 95 percent of attempted illegal entry. 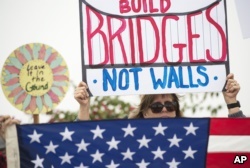 Lauren Rees holds up a sign during a rally against a scheduled visit by President Donald Trump, March 13, 2018, in San Diego. Activists for and against the president’s plan demonstrated near the site. The Trump administration is currently battling with California about its refusal to help federal agents detain undocumented immigrants in the United States. At San Ysidro, 21-year-old Jose Gonzalez expressed his displeasure with Trump’s policy. Caty Weaver adapted the story for Learning English based on AP news reports. Hai Do was the editor.